Figuring out your body shape just got a heck of a lot easier. If like us, you grew up reading all the fashion advice in Cosmo about what kind of bathing suits to wear to flatter your body, you know the struggle to actually figure out which prescribed body shape category you fall into is real. Am I an apple or a pear? An hourglass or an inverted triangle? It all kinda sounds like a load of BS, but in reality, there are advantages to knowing what body shape you should dress for. Celebrity stylist Corey Roché offers the simplest explanations for each body shape so you can finally figure out what all of this means — as well as 10 wardrobe essentials for each shape. How to tell if you're an apple: "Your shoulders and hips are around the same size," Roché says. "Apple-shaped ladies have little difference between the measurements of their chest, waist, and hips. You as an apple-shaped girl have chest and waist measurements that are fairly close, but your hips are about six inches smaller than your chest." Your bust and midriff are larger than your hips. How to tell if you're a pear: "Your hips are wider than your shoulders," Roché says, "They are also wider than your bust, making them the widest area of your body. In numbers, your hip measurement is more than five percent bigger than your shoulder or bust measurements. With a pear figure, one of your best assets is you slim midriff, which many women envy you for. Make sure to show off your killer waist and balance your wider lower half. These basic items should be the foundation of a great wardrobe." How to tell if you're an hourglass: "Your shoulders and hips are around the same size," Roché says. "Your waistline is significantly smaller. The rule of thumb here is about 75 percent: Your shoulder and hip measurements are within five percent of each other. Your waist is at least 25 percent smaller than your shoulder, hip and bust measurements. Your waist is eight to 12 inches smaller than your hip or bust measurement." Your buttocks are rather round. How to tell if you're a rectangle: "Rectangles have a very athletic frame," Roché says. "That allows them to wear boyish clothes as well as a wide range of feminine ones. Your shoulders, waistline, bust, and hips are around the same size. Your shoulder, bust, and hip measurements are within five percent of each other. Your waist is less than 25 percent smaller than your shoulder or bust measurements. Waist measures from one to eight inches (2.5 cm – 20 cm) smaller than the bust." 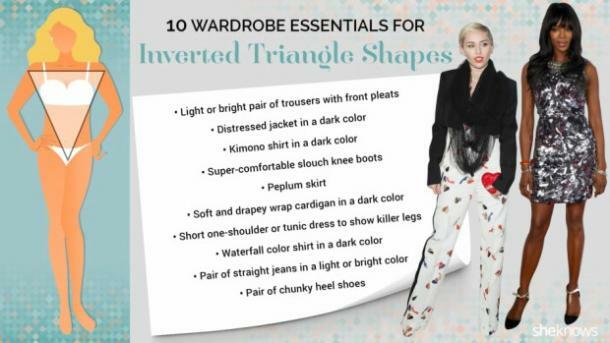 How to tell if you're an inverted triangle: "Your shoulders are wider than your hips," Roché says. "They are the widest part of your body. Your shoulders are more than five percent bigger than your hip measurement."